Nitrous oxide (N2O) has a high impact on climate change with a greenhouse gas potential of 298 CO2 equivalents. Additionally, it is a major threat to the stratospheric ozone layer. N2O is emitted from wastewater treatment plants (WWTP) during the process of biological nitrogen removal. In fact, N2O emissions can represent the major greenhouse gas emission of WWTP if more than 0.5% of the incoming nitrogen load is emitted as N2O. Significant N2O emissions from WWTP have been recorded, but most of the studies were based on short-term data. N2O emissions are difficult to measure representatively due to their considerable spatial and temporal heterogeneity. The formation and dynamics of N2O formation are still not fully understood. However, a few measures to decrease N2O emissions from wastewater treatment have been successfully tested on full-scale WWTP. In the EU project POWERSTEP, the planning, realisation and operation of one such measure – an innovative ammonia membrane stripping plant for the separate treatment of reject water – is being demonstrated in a case study in Altenrhein, Switzerland. The plant produces liquid nitrogen fertiliser (ammonia sulfate) as a main product. 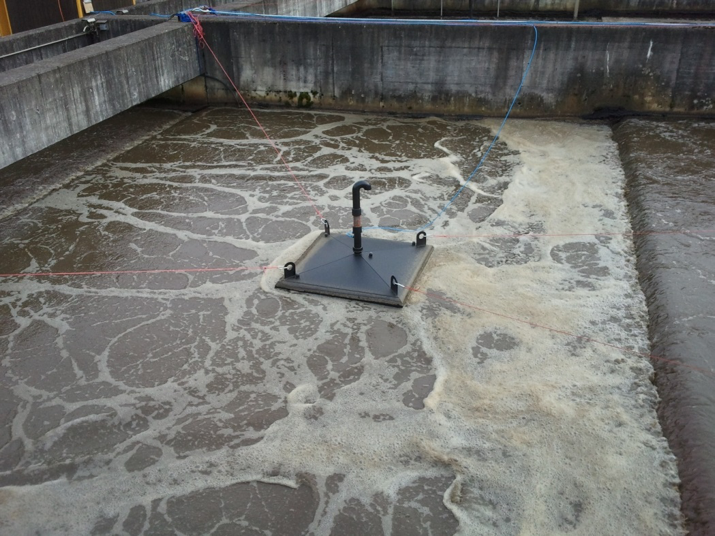 During an extensive measurement campaign, the N2O emissions were monitored at the Altenrhein WWTP over 15 months. The results showed that these emissions played an important role in the carbon footprint of the treatment plant. In addition, the impact of the new reject water treatment system on the total N2O emissions of the Altenrhein WWTP was tested. The separate treatment of reject water showed great potential to decrease N2O emissions from the WWTP, compared to treating reject water in the main stage of the treatment plant: The emissions could be decreased by 90% over a period of five months (winter season). Thanks to the successful demonstration of the reduction measure undertaken in the POWERSTEP project, a national carbon mitigation programme is now being developed to subsidise the construction of membrane stripping plants in Switzerland. This initiative is based on the Swiss national framework for domestic emissions reductions (Link). Having a national programme for similar projects in place will allow reducing the administrative costs significantly for individual projects. 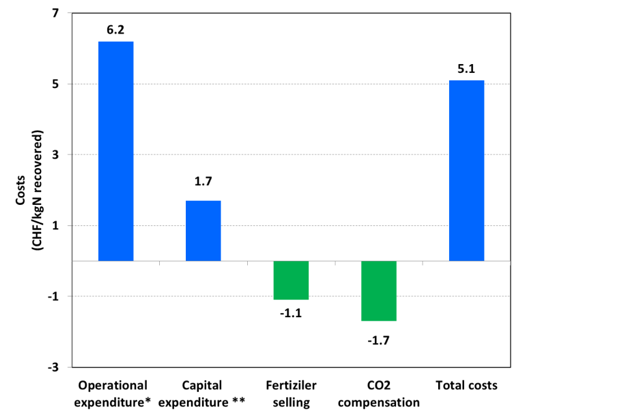 The reduction of greenhouse gas emissions is compensated with up to 120 Swiss Francs (CHF) per ton of CO2-equivalent avoided. The efficiency of the measure proposed by POWERSTEP in the Altenrhein study will be validated in the first projects under the national programme. The total costs (operational + capital expenditure) for the recovery of nitrogen from sludge treatment reject water by stripping are rather high. In the case of the Altenrhein WWTP, total costs were calculated to be 7.80 CHF/kgN (50% of heat can be covered by excess heat from WWTP). While some profit can be made with ammonia sulfate (0.6-1.7 CHF/kgN), this cannot cover the total costs. Overall, the recovery of one kilogram of nitrogen costs roughly 6.7 CHF/kgN, including revenues from selling. With the new CO2-compensation program, the total costs can be additionally reduced by 1.6 CHF/kgN, leading to a total cost of 5.1 CHF/kgN for the process. Hence, the program offers a substantial incentive to reduce the nitrogen rejection load by treating the reject water in a membrane stripping plant.